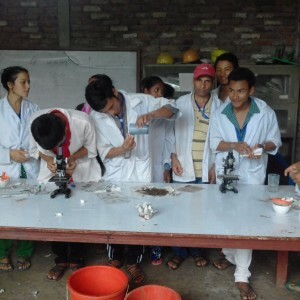 Asal Chhimekee Nepal (ACN) conducted a 35 days Village Animal Health Worker (VAHW) Training at Kantipur Bahuprabhidik Shikshalaya, Bharatpur, Chitwan. 24 participants from Gorkha and Nawalparasi participated the training. 9 out of 24 participants were female during first training. The training started on 16 July 2017 and ended on 23rd August 2017. Similarly, the training was conducted for the second time with 18 (11 M and 7 F) participants successfully completing the training. Tools like bardizoo, horn cutting wire and castration rope was provided to each student at the graduation program. The training started on the 4th Sept 2017 and was ended on 18th Oct 2017.